Sylvia of Galadryl Design is a jewelry designer and fellow member of the Starving Artist's team on Etsy. She has been creating her own jewelry since 2005 when she took a class near her home in Cologne, Germany. Sylvia's style is elegant and modern. She combines sterling silver with handcrafted lamp work beads, swarovski crystals and gemstones. Her wire wrapping skills are amazing and her pieces are finished with an oxidation and polishing process that leaves the sterling silver gleaming. She then packages her jewelry in lovely velour sachets to help prevent tarnish. My particular favorites among Sylvia's jewelry designs are her bangle bracelets which really show off her wire work. Sylvia even writes tutorials about her pieces to share her knowledge with others. 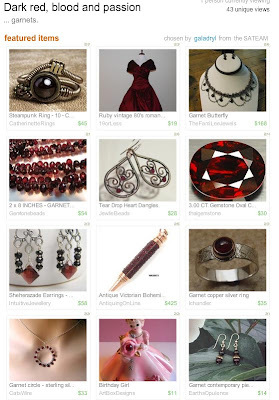 Galadry Designs was kind enough to feature Bonnie's Garnet Butterfly chain maille necklace in her Etsy treasury Dark Red Blood and Passion. Thank you Sylvia for including us in such a wonderful collection of items.